Classic style comes easy in this Vince Camuto skirt. Stretch ponte fabrication. Elastic waist. Slip-on style. Hits at the knee. 70 percent viscose, 26 percent nylon, 4 percent elastane. Machine wash cold, hang dry. Imported. Measurements: Skirt Length: 26 in Product measurements were taken using size 2X. Please note that measurements may vary by size. 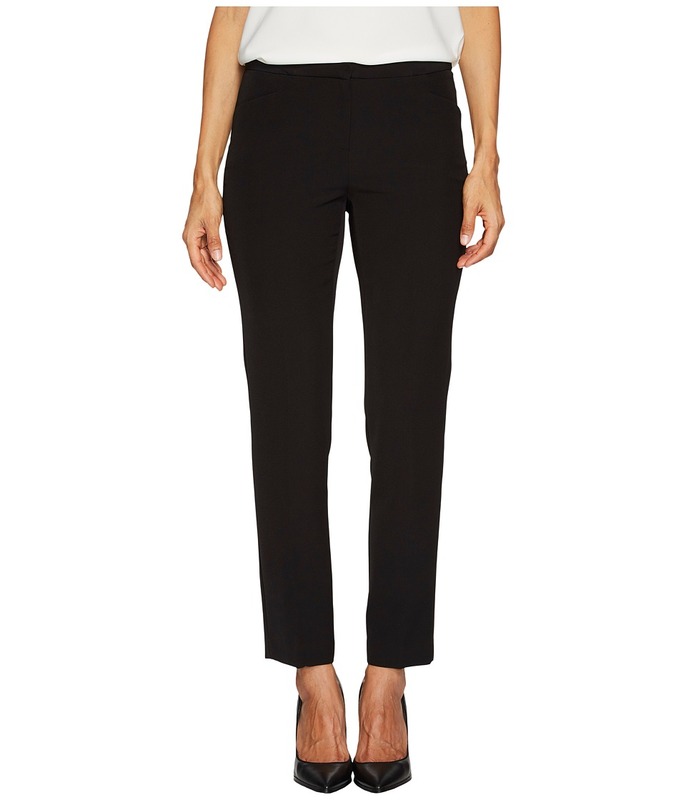 Get straight to style with this chic Vince Camuto pant. Crisp ponte knit fabric. Seaming down front creates a modern look. Tapered fit through the leg. Side zip closure. Metal brand plate at back hip. 69 percent polyester, 28 percent viscose, 3 percent elastane. Dry clean only. Imported. Measurements: Waist Measurement: 36 in Outseam: 41 in Inseam: 31 in Front Rise: 12 in Back Rise: 17 in Leg Opening: 16 in Product measurements were taken using size 16W, inseam 31. Please note that measurements may vary by size. You~ll look luxurious with this upscale Vince Camuto top. V-neckline. Three-quarter sleeve design. Side ruching creates a draped look. Curved hemline. 96 percent viscose, 4 percent elastane. Machine wash cold, tumble dry low. Imported. Measurements: Length: 31 in Product measurements were taken using size 1X (US 14W-16W). Please note that measurements may vary by size. Breeze through your day in this lovely blouse. Lightweight shirt features a unique inverted front pleat. V-neckline. Sleeveless construction. Asymmetrical hem hits at the low hip in the front. 100 percent polyester. Machine wash cold, tumble dry low. Imported. Measurements: Length: 31 in Product measurements were taken using size 1X (US 14W-16W). Please note that measurements may vary by size. A must-have pant to add to your polished wardrobe. Crisp stretch cotton fabric. Flat front. Tapered fit through the leg. Zipper fly with double hook-and-bar closure. Front hand pockets. Single back welt pocket. Ankle length. 57 percent cotton, 39 percent nylon, 4 percent elastane. Machine wash cold, tumble dry low. Imported. Measurements: Waist Measurement: 39 in Outseam: 39 in Inseam: 28 1 2 in Front Rise: 11 in Back Rise: 18 1 2 in Leg Opening: 17 in Product measurements were taken using size 16W, inseam 28.5. Please note that measurements may vary by size. 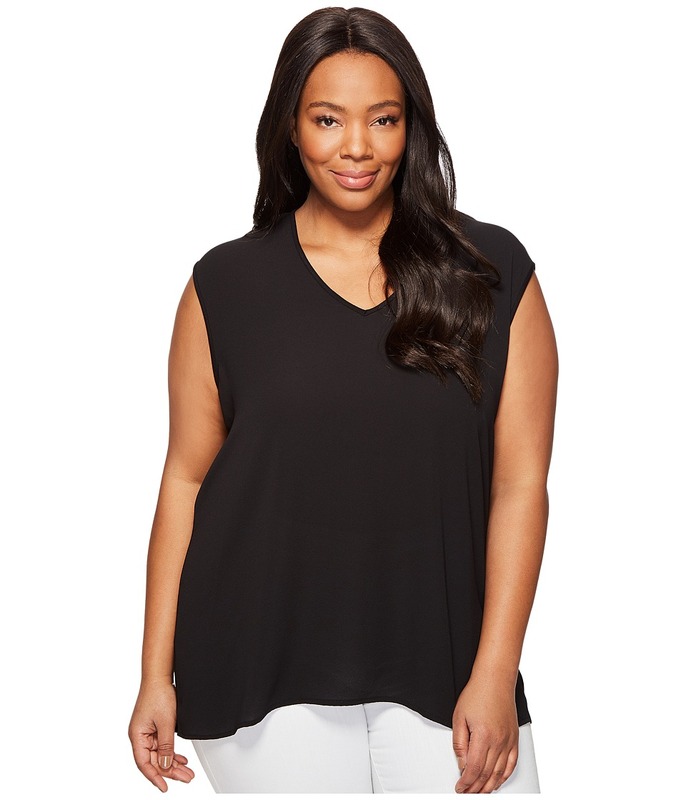 A versatile top that~s great for layering, or can stand on its own for an effortlessly polished look. Mixed media top with an easy fit. V-neckline. Sleeveless design with extended shoulders. High-low hemline. Front: 98 percent polyester, 2 percent elastane Back: 96 percent viscose, 4 percent elastane. Machine wash cold, tumble dry. Imported. Measurements: Length: 31 in Product measurements were taken using size 2X (US 18W-20W). Please note that measurements may vary by size. A polished Vince Camuto&amp#174 pant to complete your perfectly put-together look. Crafted from a stretchy poly-blend fabric with a skinny fit. Mid rise. Zipper fly with hook-and-bar closure. Slash hand pockets. Ankle length. 92 percent polyester, 8 percent elastane. Machine wash cold, tumble dry. Imported. Measurements: Waist Measurement: 28 in Outseam: 35 1 2 in Inseam: 27 in Front Rise: 8 1 2 in Back Rise: 14 1 2 in Leg Opening: 12 in Product measurements were taken using size 2P, inseam 27. Please note that measurements may vary by size. Classic style comes easy in this Vince Camuto skirt. Stretch ponte fabrication. Elastic waist. Slip-on style. Hits below the knee. 70 percent viscose, 26 percent nylon, 4 percent elastane. Machine wash cold, hang dry. Imported. Measurements: Skirt Length: 25 1 2 in Product measurements were taken using size PS. Please note that measurements may vary by size. A polished Vince Camuto&amp#174 blazer with clean lines and modern accents. Crafted from a stretch crepe fabric. Open fronts. Long sleeves. Front zip pockets. Straight hemline. Lined. 92 percent polyester, 8 percent elastane. Dry clean. Imported. Measurements: Length: 28 in Product measurements were taken using size 18W. Please note that measurements may vary by size.